We review the Bissell sweeper and the Bissell perfect sweep turbo machine. There are so many different models of Bissell sweepers that we will be mainly looking at the best models that are highly rated and affordable. Bissell’s line of sweepers can help you to quickly and easily take care of any messes on your hardwood, tile or carpeted floors. They are light, easy to use and take up very little storage space. These little machines are the perfect replacement for your broom. 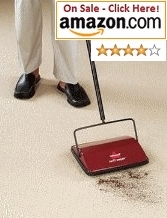 Gone are the days of hard manual labor; you can use these sweepers to easily contain any mess. Yes, it requires very little labour; however don’t think it does a lazy job! Quite the contrary, this nifty gadget can clean to the highest standards. All of these sweepers cost between the range of $12.99 and $39.99, so they are extremely affordable. We will now have a look at the highest rated and most popular models. This sweeper is differentiated from the others in that it doesn’t have a cord, but instead a rechargeable battery. Yep, this means that without a pesky cord you can clean and move around as freely as you please. The rechargeable battery lasts about 60 minutes per charge. This model has 3 brushes which automatically adjusts to your floor surface whether it is tile, hardwood, carpet etc. The dirt cup is quite large and is transparent so that you can keep an eye on the capacity levels. This machine will pick up dirt, pet hair, crumbs, paper and just about anything else off of your floors. It is extremely easy to assemble, light and is perfect for everyday use. This model has a 4 star rating from over one hundred customers and will cost you around $39.99. There are many reasons why consumers like this model and some have stated that this is the perfect “in between” cleaner. By “in between” they mean that they don’t always have to lug out the vacuum cleaner for small messes i.e. this sweeper takes care of those. One thing to note, this isn’t a vacuum and can’t replace your vacuum cleaner as it doesn’t have suction. It is great at what it does and at $39.99, that’s quite a deal! The unit takes about 16 hours to charge the first time you power it up and after that first charge, it only needs 12 hours to re-charge each time. Lots of folks loved that this machine was extremely easy and intuitive to put together and were even surprised to find out exactly how well the Perfect sweep turbo picks up all manner of messes including cat litter, stuck on pet hair, food etc. This is definitely a must-have machine for every household. This Bissell Sweeper is also another one of the highest consumer rated sweepers by Bissell. It has a 4/5 star rating from Amazon from over 120 customers and will cost you only $19.99. This Bissell can be summarized by its name; it is swift and efficient when it comes to cleaning floor messes and dust bunnies. It doesn’t use any electricity, but it doesn’t need to. This machine is well designed to slide under furniture to clean your dust collection and will adjust to any floor type. The brush is dual direction which ensures that dirt is trapped from every direction. Overall, consumers were very pleased with this cleaner as it has an intuitive design for e.g. it has a comb attached to the brush that ensures the brush does not become tangled. This is simply a great cleaner. It is without all the bells and whistles but definitely performs up to standard and exceeds them.